If you’ve never experienced the absolute and overwhelming explosion of the world at the stroke of midnight on Chinese New Year’s Eve in China, it will be hard to explain it to you. Over and over, I’ve heard foreigners describe it as “a war zone.” I’m guessing those who have seen combat could tell us how correct that analogy is, but it really is ear-splitting. You cannot have a conversation with the person standing next to you without yelling. 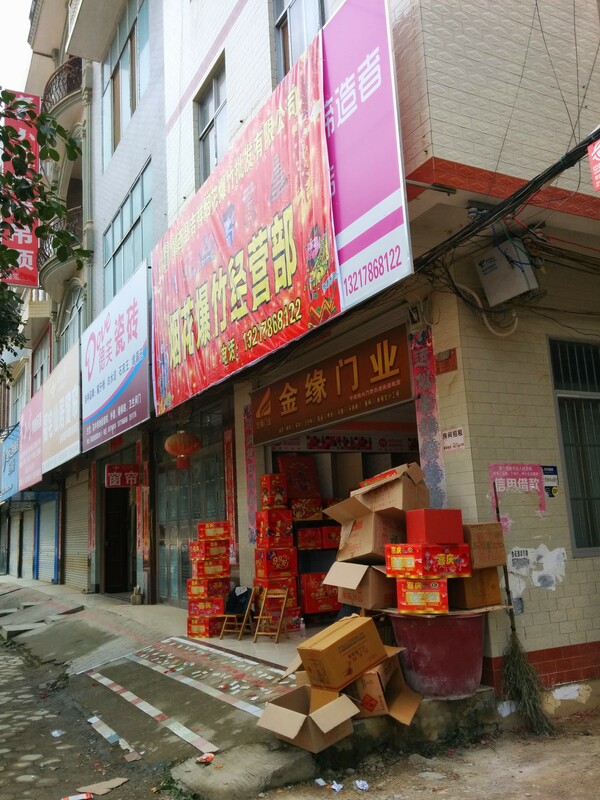 China is the world’s largest producer of fireworks, and there’s pretty much much no limit on the size or type of fireworks citizens can buy. Fireworks are also really cheap here. There are 1.35 billion people celebrating the biggest holiday of their year, and they like things renao. There’s also a lot of drinking. All the children have just been given hongbao, so they have money to burn (ha ha). And they have lighters. So, that all makes for an incredible experience. For about an hour, every piece of the sky will be filled with aerial bursts, and there will be strings of firecrackers going off all over the ground. Over the years, things have gotten a little more subdued in the cities, as more restrictions are placed on what fireworks can be set off inside the city limits (you can still buy whatever you want, you just have to go outside the city to fire them off), and the restrictions are more and more enforced. But we don’t live in a city. Things are probably going to be pretty crazy, and we want to be prepared to join in the fun/war. 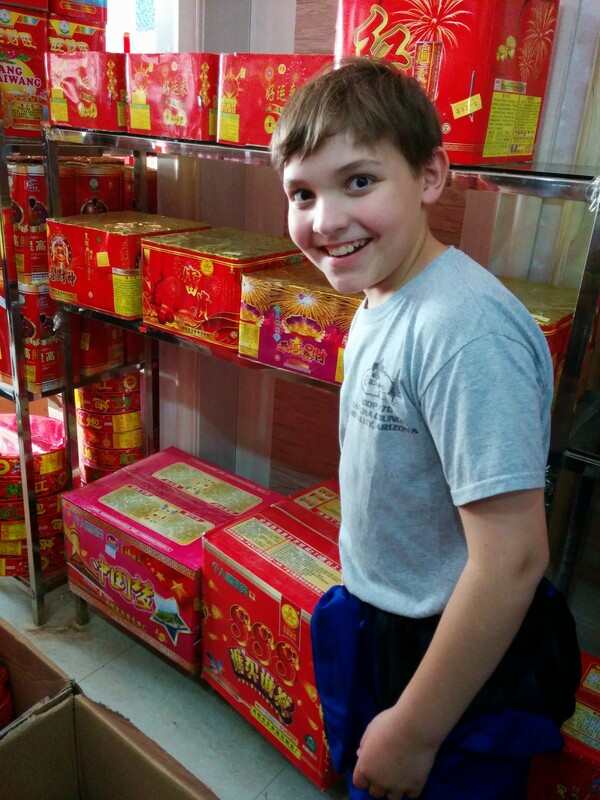 And so, we went shopping for fireworks earlier this week. Busy place! I’m probably the most excited about this of my whole family. Anyway, we tried to get a good variety, without buying stuff that could blow up a small island. The sales lady pointed us away from one marked “Thunder King” (“No, this is nothing but loud. It will just hurt your ears and set off all the car alarms”) and also counseled against bottle rockets (“Too dangerous.” Umm..compared to what exactly??) We wanted some ground displays, some Roman candles, some small aerials, maybe some sparklers. Here’s our small but respectable haul from one store. This cost a whopping 28元 (about USD 4.50) total. That really made me want to get more-bigger-better, but my husband reminded me that there will be thousands of other people lighting up the night in our town, so it’s not like it’s all on us. I did convince him we needed an additional 4-pack of Roman candles that are nearly as tall as our daughter, though. Just in case. For about a week now, there has been a sprinkling of firecrackers and little fireworks going off each day and night. Today, New Year’s Eve, there’s a huge shift. We’ve heard stuff about every 10 or 20 minutes, starting early this morning. As night falls, I’m sure it will just keep getting steadier and louder, until the final countrywide catharsis at midnight when the “war” breaks out. And we’ll be right out there contributing to the madness. Happy New Year!